NASA had the opportunity to make the case for planetary defense at last week’s meeting of the House Science Committee. Unfortunately, as Jeff Foust reports, NASA Administrator Major General Charles Bolden (USMC-ret.) failed to make that case. Bolden’s comments were particularly strange since presidential science advisor John Holdren, who also testified at the hearing, did come out for a significant increase in spending on asteroid detection. “I think we would want to be spending upwards of $100 million a year [compared to the current $20 million,” Holdren said. Even $100 million is a small fraction of the NASA budget, of course, and it seems dismaying that General Bolden would not support even that much. 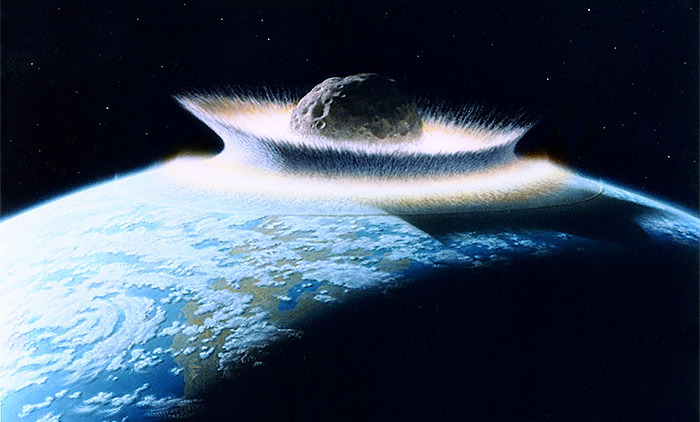 Large asteroid impacts may be rare events, as Bolden says, but rare events are the reason we buy insurance policies. $100 million a year seems like a very small price to pay for a policy that would cover the entire human race. This statement is spot on. There are so many unknowns, when it comes to asteroids, that first-hand inspection is essential if we are to be ensured of the success of future deflection missions. Unfortunately, while NASA may be working to accomplish a visit to an asteroid by 2025, it isn’t working on it very hard. NASA is pouring billions of dollars into developing the Orion capsule and Space Launch System, which are neither necessary nor sufficient for the asteroid mission. If an asteroid mission were a priority, NASA could accomplish it much sooner (and more cheaply) using systems such as the Space-X Dragon capsule and Falcon launch vehicle, Atlas and Delta launch vehicles, and Bigelow inflatible habitat modules, which are already in production or in advanced states of development. To delay a human asteroid mission for the development of Orion and SLS is akin delaying the US entry into World War II so Howard Hughes could finish developing the Spruce Goose, instead of using the DC-3. It makes no technical, economic, or programmatic sense. General Bolden must know this, if he is getting competent technical advice. Of course, space cynics will say that Dragon and Falcon are still in development. Commercial programs can (and often do) fail, as former NASA Administrator Mike Griffin is fond of noting. Griffin errs, however, when he implies the contrapositive position — that non-commercial programs never fail — which is provably false. There is no reason to believe that Dragon and Falcon (which are farther along in development than Orion and SLS) are more likely to fail than Orion and SLS. NASA could do a quick-and-dirty asteroid mission using a Bigelow module, Dragon capsule, and some combination of Falcon, Atlas, and/or Delta launchers. A more effective mission would entail the development of a dedicated deep-space exploration ship, such as Johnson Space Center’s proposed Nautilus-X. The Technology Application Assessment Team at JSC has estimated that Nautilus-X could be developed in just over five years at a cost of $3.7 billion. Unfortunately, there is no funding for the development of such systems at present because NASA is pouring all of its available funds into Orion and SLS. NASA leadership has historically shown little interest in planetary defense. The United States Air Force has shown more interest than NASA has. Unfortunately, while NASA is taking modest cuts as part of Congressional efforts to get the Federal budget under control, the military space budget is being cut to the marrow, so it’s unlikely the Air Force will be able to pick up the ball if NASA drops it. Orion and SLS are popular programs with certain members of Congress, and it would take real leadership on the part of NASA’s Administrator to make the case for change. The current interest in planetary defense could provide an opportunity for such leadership. Unfortunately, General Bolden seems to be squandering that opportunity. This is not the first time the General has failed to make the case for a strong, yet cost-effective, space program before Congress. We can only hope that he starts to act more like a fighter pilot and less like a political appointee who doesn’t really want the job. I am wondering if General Bolden got word that the one place Lamar Smith would look to short for funds, so that an Orion/SLS mission could be done, would be Commercial Crew. The idea that it would be better to encourage commercial groups like Planetary Resources, who we should note were excluded from testimony, is anathema to those who would entrench SLS/Orion as the BEO standard for the US. NautilusX might be government, but its a distraction that would require more expression of political capital, when the money is already being all funneled through the Orion/SLS deals, anyway. Every time the advocates of SLS/Orion go to another politician, seeking votes, they will use up political capital in *some* form. For instance, observe who among the SLS/Orion crowd voted to confirm Hagel for SecDef. The 100+ different NASA technology development programs that *should* be using the money for SLS/Orion would each require expenditure of a bit more political capital from those protecting jobs in and around NASA Centers. The total political capital expended for those programs would be far higher, just because there are so many of them, than the political capital expended to get SLS/Orion through Congress. Funds should flow smoothly to NASA, CERN etc. Nobody is bothered about Truth of physical sciences. CERN scientists are befooling themselves and ignorant people. If Higgs Boson is a God particle arising from Big Bang 13.7 billions years ago then the rational question arises whether God can exist under Big Bang paradigm. Rationally God cannot exist under Big Bang paradigm because for any existence including God; substance is a pre-requisite and substance will occupy space. At the time of Big Bang there is no space for God to exist and what comes out of Big Bang is space, time, matter & light/radiation. Now there is no space for God to exist before Big Bang so he cannot exist afterwards. We know matter is made up of protons, neutrons & electrons and as such God cannot be in the matter also, He cannot be in time as time has also started at the time of Big Bang. Since we know what is light/radiation and we are in a position to produce light/radiation; hence God cannot be in the light/radiation also. Then where is God. CERN scientists are deceiving the ignorant fund providers by giving them the notion that they have found the God particle whereas they are working under a paradigm of physics under which God cannot exist. Physicists & philosophers of the world act as mute spectators. This article is a combination of ignorance, myopia, and fear-mongering at its worst. It’s bad enough NASA gets raped by legislators more interested in handing out goodies to their special interest social programs but it’s somewhat incredible to see this kind of self-flagellation from the pro-space community. Administrator Bolden responded practically and with an eye toward putting precious funds where they would have a more immediate impact. This is indeed a mission more in line with NASA’s rather than the Air Force’s charter but realistically, the effort you’re calling for is a waste. You have your analogy exactly reversed. Postponing the heavy lift we would need to mount a rapid interplanetary mission in order to mount a sightseeing trip using systems designed for low-altitude LEO missions is like pushing off development of the P-51, B-17 and B-29 in favor of bulding more PBYs and the Spruce Goose. You do NOT need human inspection of the asteroids — recall the success of the NEAR mission well over a decade ago. There are two things you need to deal with this problem: early detection (to give us time to get something out there) and a long-duration propulsion system we could mount to the asteroid in order to divert its course. Simple orbital mechanics will tell you that a small sustained push early in the orbit will accomplish more than a huge instantaneous delta-v close to conjunction. Oh yeah — a third thing: you need to GET that propulsion system out to the asteroid FAST. Two big problems with pouring money into a NEO detection campaign: first, the public has a very short term memory and would forget the scares that caused them to support the effort and second, what can you do about the asteroid once detected? By spending the funds instead on bolstering a reliable launch system that won’t require years worth of gravity-boost trajectories to get to the asteroid belt, we will be more likely to develop an ability to respond if/when a threat object is detected. I’m not a big fan of the long stick design but putting the funding into rapid reliable interstellar deployment meets more objectives in the long run and is more likely to give us options if/when the killer asteroid is ever detected. Administrator Bolden isn’t squandering an opportunity, he’s trying to maximize the utility of any dollars spent. The public is not as stupid as you imply. The American people have been aware of the planetary threat for some time. Just watch the Discovery Channel, or visit Barnes and Noble. It is the politicians who are lagging in their awareness. The NEAR mission did not begin to scratch the surface on asteroid knowledge (figuratively or literally). The notion that robots make humans obsolete is a common fallacy not supported by real-world data. As researchers have pointed out, a single geologist could do more science in an afternoon than the Mars rovers do in weeks. Referring to human missions as “sightseeing trips” shows that you haven’t keep up. Re: “Postponing the heavy lift we would need to mount a rapid interplanetary mission” — We already have heavy lift in the form of Atlas, Delta, Falcon, etc. Presumably, you mean superheavy lift. That is not needed for interplanetary missions. With orbital assembly, we can build any size spacecraft in orbit. What’s needed is not superheavy lift but affordable lift. Without that, no one is going anywhere. You don’t “maximize dollars spent” by developing a huge rocket that makes human spaceflight more expensive. Calling SLS “a reliable launch system” doesn’t make it reliable. A rocket that costs billions of dollars per flight will never be reliable. Achieving reliability requires large numbers of flights to work down the learning curve. Due to its huge expense, SLS will never fly more than one or two times a year. You missed the points. When you’re talking about planetary defense, the question isn’t a scientific survey of asteroids, it’s detection of a potential threat and being able to respond to that threat. The response part requires rendezvous (which NEAR addressed) and docking to add the engine. I am all for human exploration but you’re mixing up scientific exploration with your presumed rant about planetary defense. Very different missions and very different needs for human presence. I’m with you if you want to argue for cheaper ways to accomplish interplanetary science with human presence but you need to divorce that argument from the planetary defense rant. You put down SLS and Orion which are supposed to be designed specifically for interplanetary work but claim NASA could do “quick-and-dirty” using a Bigelow module or Dragon capsule thinking you’re going to launch it on a Falcon. Really? All three at least have the advantage of flying at least one but neither Bigelow nor Dragon were engineered for that kind of mission so I don’t think it’s as quick as you may think. You have to get the diversion engine to the asteroid quickly once it is detected. That requires engines with significant boost so you don’t spend precious months on orbital assembly or years of gravity boost trajectories like Galileo had to use. The whole point of focusing efforts is to GET operational experience and reliability out of a system that has the potential for allowing us to react in the timeframes available rather than squander funds chasing phantoms. By the way, I used to watch the Discovery Channel until it was overwhelmed with garbage like Monster Quest and UFO Hunters. I still watch the occasional special but the current state of the Discovery Channel as well as the History Channel, TLC, etc. disproves your point about an informed public. There are unfortunately more people interested in “Ancient Aliens” or hunting sasquatch than in interplanetary missions and mixing up scientific research/exploration with Hollywood-esque “save the planet” scares don’t help. Detection is only the first step. We need to know a lot more about the composition and internal characteristics of asteroids to determine which deflection techniques are likely to work. Are they solid bodies or rubble piles, for example? You are misinformed about Dragon and Bigelow. SpaceX was designing Dragon for interplanetary missions when I first heard about it back in 2003. Elon Musk isn’t interested in ISS missions, except as a means to his end. He wants to go to Mars. The Bigelow modules were developed from NASA’s Transhab concept, which was intended for Mars missions. JSC has produced recent concepts for interplanetary ships that use Bigelow modules. The idea of spending years (and tens of billions of dollars) developing a superheavy lifter in order to avoid “precious months” of orbital assembly is goofy. Not that it takes months to dock modules together. Orbital mechanics doesn’t work that way. If you want to get operational experience, you need to fly, a lot. Putting all of your money into one big rocket which you can’t afford to operate is the wrong way to go about it. I think General Bolden missed the point. It’s true that the probability of a civilization-destroying collision is extremely small, but the consequences are huge. Our state of mind would be much better, thinking that we are seriously trying to prevent it. And that is worth a lot, in my opinion.